Tag line: "When the cheering stopped, there were... Eight Men Out"
Back in 1919, there was little doubt in the minds of any sports fans that the Chicago White Sox were the best team in baseball, and veritable shoe-ins to win the World Series. With such star players as “Shoeless” Joe Jackson (D.B. Sweeney), Buck Weaver (John Cusack), and Eddie Collins (Bill Irwin), not to mention a couple of great pitchers in Eddie Cicotte (David Strathairn) and Lefty Williams (James Read), they appeared unbeatable. But there was a problem most fans weren’t privy to: the team’s owner, Charlie Comiskey (Clifton James), was a tightwad who refused to pay his players what they deserved. So, after winning the American League pennant, first baseman Chick Gandil (Michael Rooker) started talking to some gamblers, who stood to make millions if the heavily-favored Sox were to lose the World Series to the Cincinnati Reds, the underdog National League champs. Promised huge amounts of cash by notorious mobster Arnold Rothstein (Michael Lerner) if they lost, Gandil was able to coerce several teammates, including Cicotte, Hap Felsch (Charlie Sheen), Swede Risberg (Don Harvey) and Fred McMullen (Perry Lang), into throwing the World Series. Buck Weaver, who knew about the arrangement but didn’t want any part of it, tried to convince his teammates to forget the money and give it their all. Alas, the Sox went on to lose the Series in eight games. A few days later, when Chicago sportswriters Ring Lardner (played by the film’s director, John Sayles) and Hugh Fullerton (Studs Terkel) started printing headlines suggesting the Sox players intentionally threw the series, an investigation was launched that would give baseball a black eye for many years to come. With an all-star cast at his disposal, John Sayles successfully brings this story of America’s pastime at its darkest hour to life. 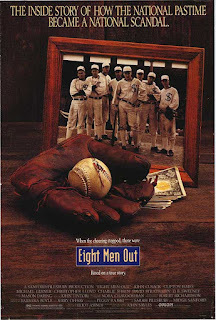 Yet just as interesting as the film’s cast, period set pieces and baseball re-enactments is the angle Sayles chose to relate this real-life tale of corruption. With so many characters to vilify in Eight Men Out, like Arnold Rothstein and Sleepy Burns (Christopher Lloyd), who initiated the fix, or even players like Gandil and Felsch, who not only threw the series, but bragged about it afterwards, the director set his sights squarely on one man as the catalyst for all the treachery that transpired: the team’s owner, Charlie Comiskey. Early in the film, we’re shown just how stingy Comiskey is when he cheats Cicotte out of a year-end bonus, then sends the team flat champagne to celebrate their taking the A.L. Pennant (when the players ask for the bonuses they were promised for winning, Comiskey’s representative points to the champagne and says, “This IS your bonus”). Clifton James delivers a superb performance as this mean-spirited cheapskate, and in the end, as sad as we are that the Sox lost, we can’t help but smile at how much losing bothered ‘ole Charlie Comiskey! Sure, we’re not happy with some of the players, who, in the long run, were cheating their fans more than anyone, and we don’t particularly like the gamblers, especially when they resort to threats to ensure everyone stays in line. Yet the one character in Eight Men Out we downright hate is Charlie Comiskey. In a movie chock full of seedy individuals, he stands above them all as the absolute worst. I didn't love this movie, but the cast is good and I at least have to give a lot of credit to Sayles for showing how painful it was to watch these guys throw (pun intended) their lives and careers away. Good post!